Did y’all see we just launched a new planner? It’s a pretty undated planner, made with beautiful paper and lots of love. It’s called the Perpetual Planner and you can see it here (you can also read a more detailed article about it here). With this pretty new planner, my planner sticker obsession has hit a new high. And that’s saying something, y’all, because my planner sticker obsession is NO JOKE. 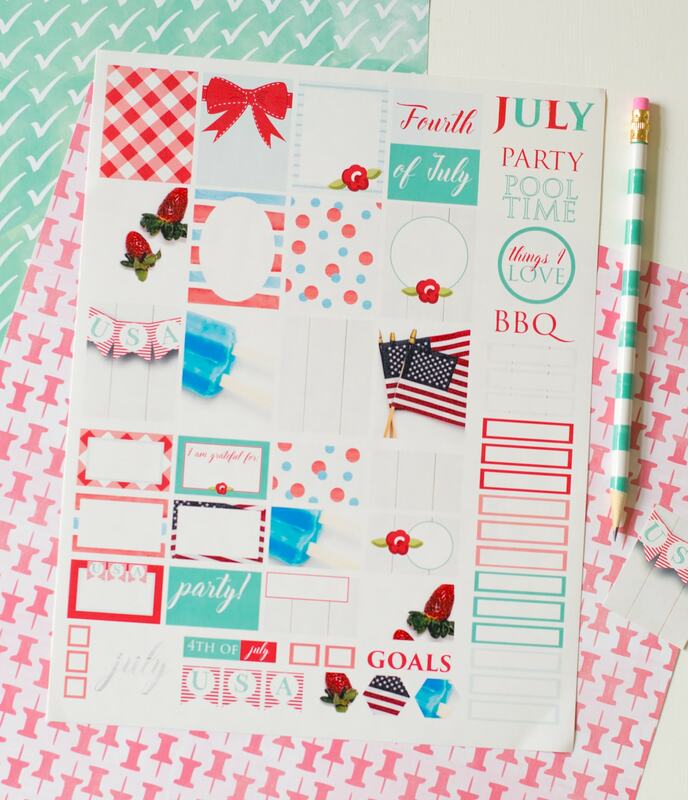 I made these printable 4th of July planner stickers for my new planner, but they will fit in many planners – including our Intentional Life Day Planner, the Erin Condren Life Planner, and everything in between. Of course, the benefit to buying ready-made stickers is that they’re pre-cut for you. And I’d be lying if I said cutting out your own stickers is easy. It’s kind of a pain. But, it’s also a ton cheaper and gives you even more options – so I like to mix it up and do both. Here are some tips for making your own planner stickers. You can also get some great tips for printing beautiful, high-quality stickers from your home printer here. OK now you are all set to print, so…on to these stickers! I wanted something summer-y and 4th of July-themed, but I wanted to deviate a tiny bit from just your typical red, white & blue. I love the red, white and blue…but I wanted to put a different, slightly mellower spin on it for this Perpetual Planner vibe. Also I wanted them to be stickers you could use the week of the 4th, but would also want to use for the rest of the month (and potentially, any patriotic holiday and the rest of summer, too). I hope you love them – I’d love to see what you do with them! Come share in my Facebook group or tag me at @carrieelleblog on IG. And do you like printable planner stickers? Is this something you want more of? Let me know – I’m thinking a Back-to-School might be next! The sticker look amazing and beautiful but also painful and hard cut. I’ll give it a try and pray I don’t die from exhaustion. Great tip. Thanks a bunch for sharing this lovely idea.